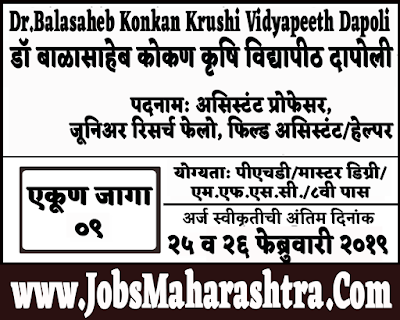 Dr.Balasaheb Konkan Krushi Vidyapeeth Dapoli Ratnagiri inviting application for Assistant Professor, Junior Research Fellow, Field Assistant/ Helper posts. For more details like age limit, salary, how to apply, selection process please refer the below article. Age Limit:- Maximum age limit is 38 years. Application form attached to the related departmental advertising PDF. JRF/Field Assistant/ Helper:- The eligible candidates will be interviewed by the selection committee.